The dressage Grand Prix Special concludes with a powerhouse podium; eventers prepare for cross-country day. Germany’s Isabell Werth reacts after her winning ride with Bella Rose in the Grand Prix Special. 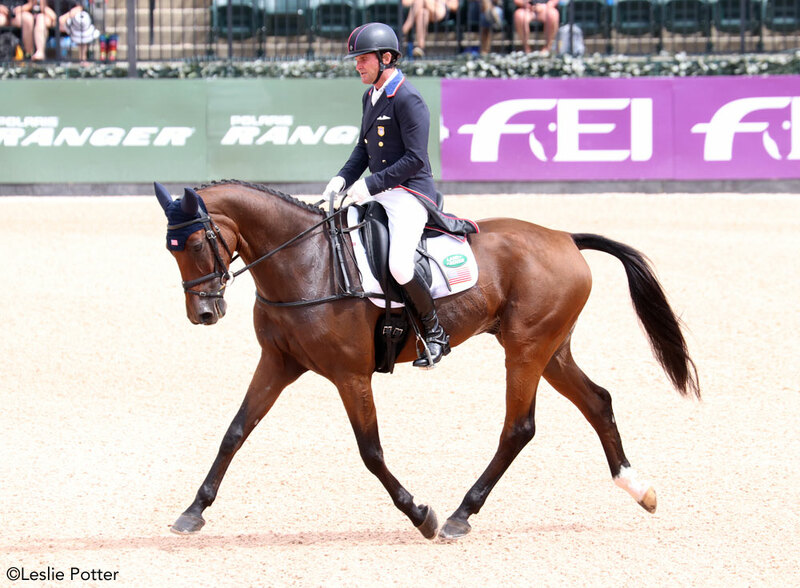 It was all dressage, all the time on day two of the FEI World Equestrian Games Tryon 2018. 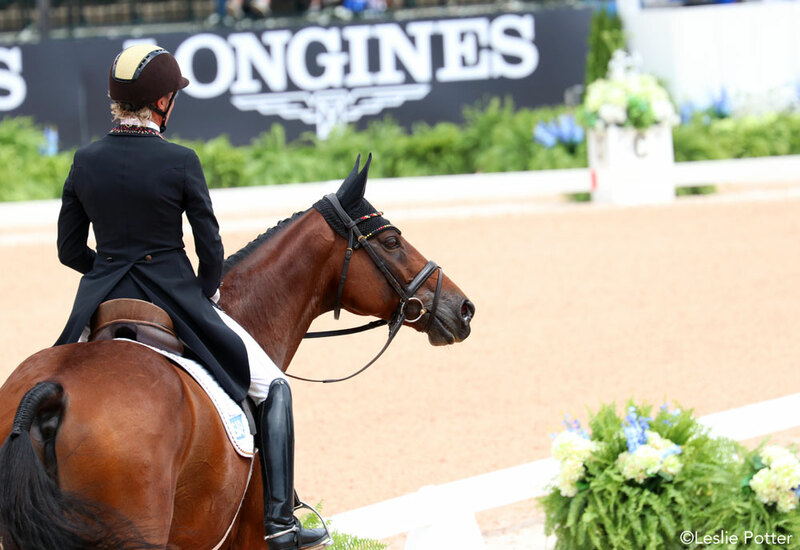 Dressage riders competed in the Grand Prix Special in the US Trust Arena while the second half of the three-day eventing field completed their tests in the Tryon Stadium. Repeating her top finish from the Grand Prix yesterday, Germany’s Isabell Werth came back with the highest score of the day in the Grand Prix Special. 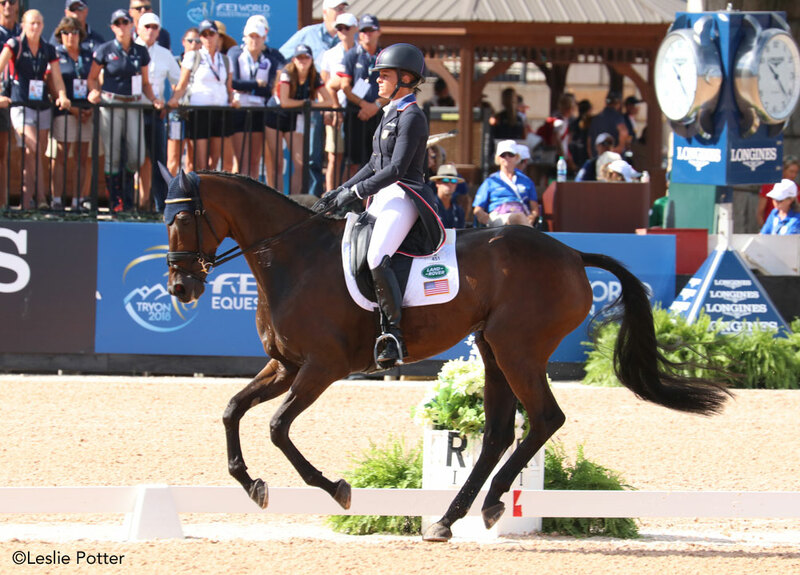 Completing a precise ride with the animated Westphalian mare, Bella Rose, Werth earned an 86.246%, nearly five points ahead of her closest competitor. That competitor was the United States’ own Laura Graves and her Dutch Warmblood gelding, Verdades. Graves and Diddy repeated their second-place finish, posting an 81.717% to enthusiastic cheers from the home-turf crowd. 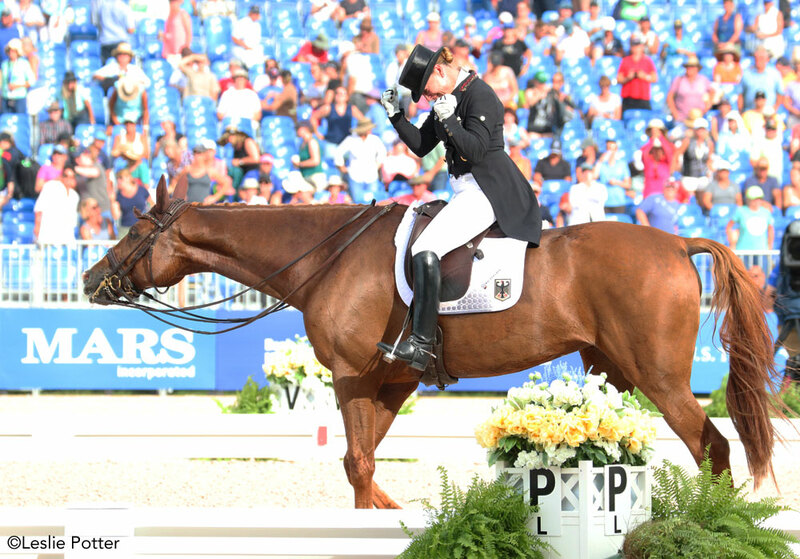 American rider Laura Graves and Verdades earned individual silver in the Grand Prix Special. Great Britain’s Charlotte Dujardin finished a close third, earning an 81.489% with Mount St. John Freestyle, a nine-year-old Hanoverian mare. American Kasey Perry-Glass also finished in the top 10 with the striking 15-year-old gelding, Goerklintgaards Dublet. 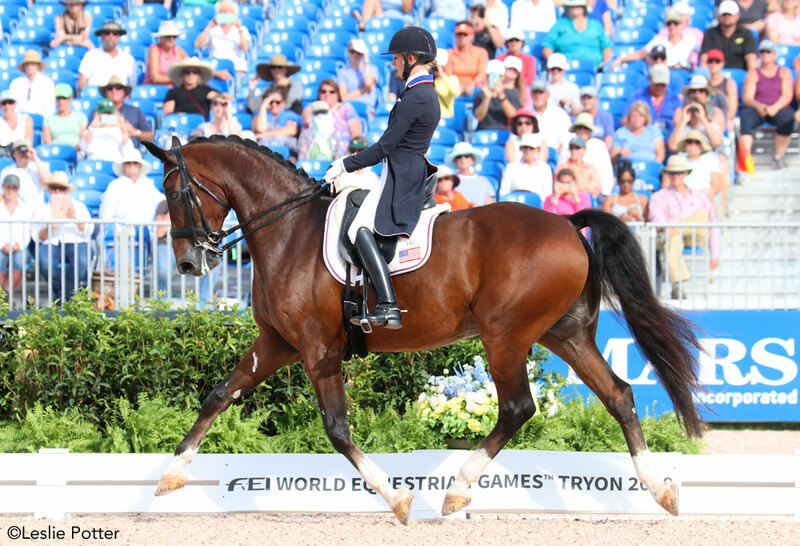 Dressage at WEG will conclude on Sunday morning—assuming no hurricane delays—with the Grand Prix Freestyles. The dressage phase of three-day eventing concluded today with the second half of competitors completing their rides. Germany holds the lead in the team competition heading into cross-country. Julia Krajewski maintained the top of the leaderboard after her impressive 19.9 penalty test on Thursday. Her teammate, Ingrid Klimke, joined her at the top with her test aboard SAP Hale Bob OLD today, which scored a 23.3 and put her in second place. Ingrid Klimke of Germany with SAP Hale Bob OLD are currently in second place individually. Rosalind Canter of Great Britain posted a 24.6, putting her in third individually and helping the British team secure second place in the team competition. The United States team currently sits in third place. Phillip Dutton rode the 10-year-old Zangersheide gelding, Z, to a 27.6 and is currently tied for 12th individually. 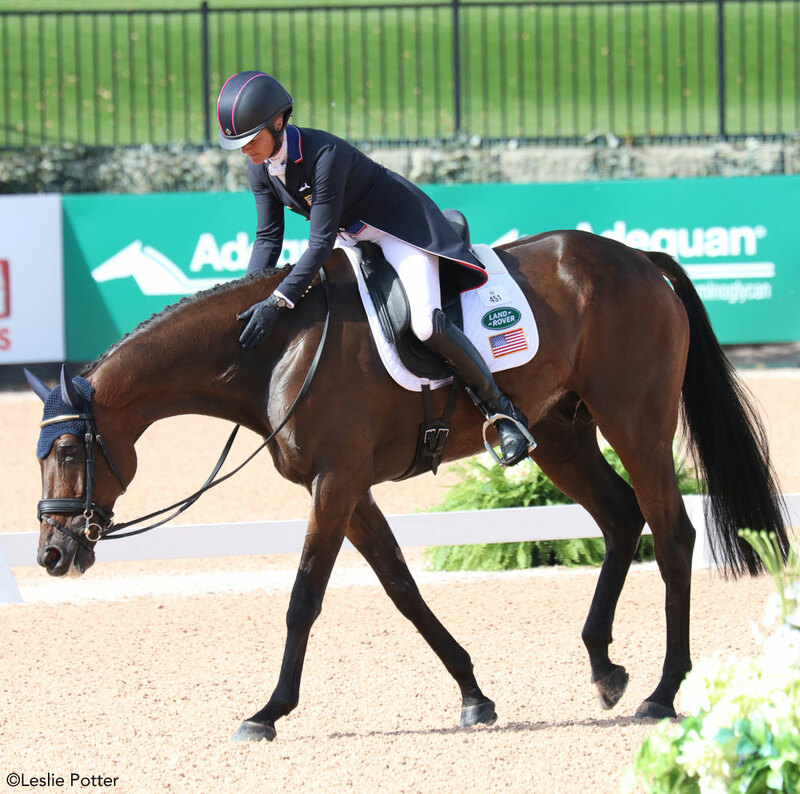 Lynn Symansky and her longtime partner, 15-year-old Donner, earned a 28.3 and are in 18th place. FEI officials announced today that one of the competitors in Wednesday’s endurance race, a 20-year-old gelding from New Zealand named Barack Obama, was euthanized at the Tryon Equine Hospital. The race was cancelled due to hot and humid weather conditions and difficult trail conditions after a heavy rain shower on Wednesday. More than 50 horses were held or treated for metabolic concerns. 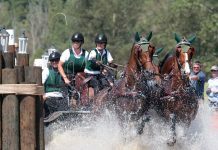 It is with great regret that we confirm that the horse Barack Obama (FEI 102TG75), ridden by Team New Zealand’s Jenny Champion (10017709) in the Endurance Championship at the FEI World Equestrian Games™ Tryon 2018 on Wednesday (12 September), has been euthanised this afternoon.The horse, a 20-year-old Anglo-Arab gelding, was taken to the Endurance Treatment Clinic after being transported back from the second loop of the 120-kilometre ride. He was treated for kidney problems onsite at the Tryon International Equestrian Center (TIEC) and then transferred to the Tryon Equine Hospital for further treatment. The horse’s owner, Mark Round, in consultation with the athlete and veterinarians, today elected for euthanasia. In line with the FEI Veterinary Regulations, a post mortem will be conducted and samples will be taken from the horse. 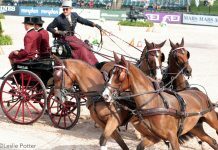 The horse had been competing in international Endurance events since 2009 and had 16 FEI event starts, including six 160-kilometre rides. Jenny Champion took over the ride on the horse in 2014 and together the partnership had won six times. Wednesday’s ride was cancelled due to the combination of extreme heat and humidity, an unusually high number of horses displaying clinical signs of metabolic issues, and the additional exertion required of the horses following heavy rainfall. No medals were awarded for the endurance race. The Spanish team, whose members had been leading the race, filed a protest, asking the FEI to award medals based on the riders’ position at the time the race was canceled. Their protest was denied. Your WEG Moment of the Day for Friday, September 14: American eventer Lynn Symansky rode her longtime equine partner, Donner, to a 28.3, putting them in 10th place heading in to cross country day. The score is Donner’s personal best for the CCI4* test.